Chris Paul has started exclusively at the position of point guard. Paul has won the NBA Rookie of the Year Award, an Olympic gold medal, and led the NBA in assists three times and steals six times. He has also been selected to eight NBA All-Star teams, six All-NBA teams, and six All-Defensive teams. He was selected fourth overall in the 2005 NBA draft by the New Orleans Hornets and traded to the Clippers in 2011 and now plays for he Houston Rockets . Off the court, Paul has served as the National Basketball Players Association president since August 2013. 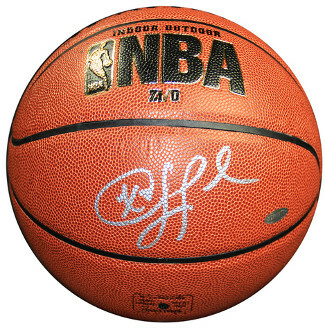 Chris Paul has hand signed this Spalding NBA Indoor/Outdoor Basketball. Steiner Sports Hologram and Certificate of Authenticity.